Hey, great Blog. Love the designs. YEAH!!! I love these! and your descriptions really make me want to go play ball again...NOW! but i wouldn't be cool like the Yankee, I'd look like a football player with a helmet, sliding pants and elbow pad cause I've turned into a wimp. and no tabacco either, just sunflower seeds in my back pocket. I really like how you made all 3 different moments in the game and used 3 different eras of uniforms and body shapes... Now drop that pen, grab your glove and lets GOoooo!!! these are really cool - love the robinson. Mercy! Argh! So awesome! Can't bare it! I want more! Dude, I'm annoyed that they don't wear stirrups as prominently anymore. I love the pitcher designer. So cool the way you designed the hands. and yeah, dude, whenever you are free we can grab something to eat. I am f*cked by the immigration office...or is it pixar? hahahaha! Those are all great Shane, I especially love the Jackie Robinson. Guys thanks allot!! Hopefully even if people don't like basebalkl I could at least giv a cool feel to some baseball images. MACLEOD- Dude , me to! It looked so cool the way Dimagio and Williams wore there uniforms. And Honus wagner too!! I actualy did a Honus Wagner piece that I'll post later. Todays uniforms are B.S. Amazing Stuff here! Thanks for the comments. I have been a huge fan of yours for a long time now. These are great Shane. Dig the old school uniforms. thanks man. these baseball dudes are really nice. i feel like buying some baseball cards now. cardboard gum and all. yeah, dont be heackling me, i dont even know why im on the panel. ill drop your blog in the session. i love the guy chewing!!!!! Man these are great dude!! Your designs are so fluid and ful of life! Yeah winter has hit down here in NZ and it's freakin freezing!!! Thankfully, it doesn't get to windy up here in Auckland, that's saved for the Wellingtonianites (people from Wellington)!!! These drawings are so inspiring! I've been picking away at an old-time hockey comic forever and this is really invigorating to look at. Old sports images are the best. Hey Shane, neat baseball images. And thanks also for stopping by. You got some great work here. Great designs, man! Nice touch you have. You really push design well. Killer designs, man...I can smell the dust and dirt on their knees...wait; that sounds weird. Beautiful work, Shane. I love the hands of the first one. Your work is beautiful...it feels so carefree like you just throw it down so easily :) Very nice flow to all your lines! God , your painting is getting so good! these are fantastic! they're shape give them immediate personalities. Dude, these drawings are the shitballs. I think that's the first time anyone's ever used a wad of tobacco as part of a gesture...f-en outstanding! You should totally do some elderly mermaids, regardless of lateness. A lot of late-joiners have done some of the old assignments. The first was deformed sorcerers, so you can bust out the ol' monster manual and do some of them too! I'll see if I can get Teddy Newton to join. Awesome, man! Sketch greatly! Awesome stuff man . Love 'em ! You really got your old uniform right, the dirt from always slidding and everything, I love it! You really should go play ball. i don't like baseball, but i love these. well done shane. well done. Really awesome, Shane; they have a great nostalgic feeling about them. The way you handle cloth is amazing! An inspiration, Shane. i love these guy's just love them, to show my love i did a little drawing to show how much i like them, if you have time check out my blog 13toons.blogspot.com, thanks for the great post, and i can't wait to see whats next. bye 4 now. Goodness I love these. These are amazing. WOW!!! I love the baseball players!!! WOW! glad i found your blog. GREAT stuff. mind if i link? Really nice designs! I love that style, glad I found your blog! Holy cr*p these are soooo good. !! so rad man! so rad! I played baseball when I was real little, but they always stuck me in the out field... behind the fence. Not sure what that meant. So I got into animation instead. Later! Where's the Angels ya big JERK?!! This is a beautiful series. I really like this style of yours. soooo cooool!!! your blog rocks bro! P.s. I love the planes too, especially the old ones!!! 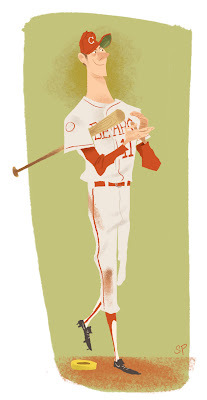 Great work on the baseball characters as well as the other great work on the blog. Are you familiar with Joe Moshier? I think you will really enjoy his work. OHHHHH!!! I just love your work!!Amazing! THANKS!! incredible series. Love the baseball theme. sure would make a nice bound collection if you did a whole bunch of these. maybe bonds didn't hit us that home run ball cause you didn't draw him yet. great. Man, I love these three pieces. They would look amazing side by side in a frame. A constant source of inspiration. Thanx! that jackie is killer!!! great stuff! nice poses and your hands are great! yeah, I still love em. For your book, are you gonna do just caricatures of pro players or a mix of lots of leagues and ages? Is there a waiting list for the book :)? Hey everyone, HOLY CRAP, I'm glad everyone likes these guys. 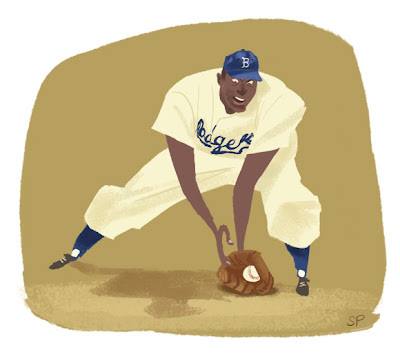 And to answer your question Nathan Lindsay- I have a ton of baseball doodles and moments that cover everything from Little league to 1940s Womens leagues , to turn of the century to present. And maybe a couple charicatures and Omages here and there. But all different takes and styles. It will fill a book. I love drawing this stuff and people have been bugging me to do some sort of sketch book. Well this will be the first. Again, Thank you everyone for your incredibly kind feed back. It is greatly apreciated. Stunning artworks! Great style and technique, is it Cintiq? wow!!! these guys are awesome!! These are incredible, you are winning at life. Really fantastic! Are these Digital? Jackie is just awesome. Are these digital?